Late 2018 Note: Box discontinued but maybe available as a single serve? 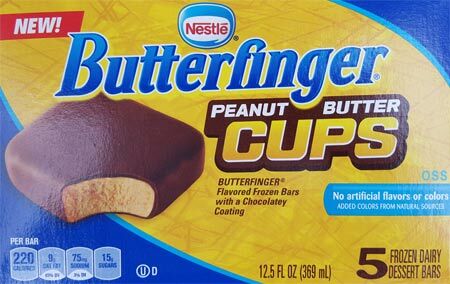 [New for 2016] As a lover of Butterfingers but not so much Butterfinger peanut butter cups, I was still pretty excited when I first spied the box containing today's review. Geez, pretty small at 2.5 oz. Might be tempted for a second one depending on how well this goes. If you are wondering, no, I didn't notice the Butter finger bits you see. The shell makes fun cracking sounds but the chocolate is by no means the main flavor going on here. 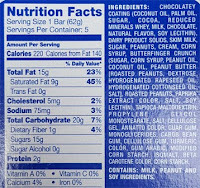 We're not getting the usual Butterfinger chocolate to filling flavor ratio. I want both sides to be stronger though by now I should realize that's often a tough request when translating from regular candy bar to frozen dessert bar. There is a fairly unique aftertaste. In one way, it's kind of annoying and not quite right. Fake maybe and not a positive. On the other hand, part of me does get a lingering Butterfinger vibe to it. Am I tempted for a second one right now? Nope. On Second Scoop: With lowered expectations and a hungrier belly, this tiny 2" x 2" treat isn't bad. A small part of me was actually tempted to go for a second one today. The Butterfinger vibe could be stronger, and it is frozen dairy dessert, but it's not a total loss. I suspect (hope) they will grow on me as I finish off the box over the next week or so. Don't rush out for them, but if there's a sale, sure, give them a shot if you are tempted. 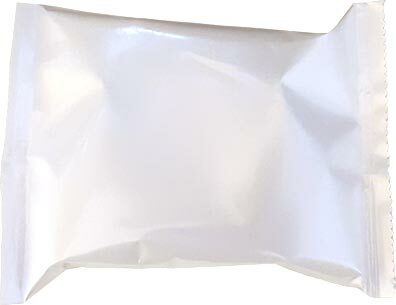 More importantly, how did the battery taste? 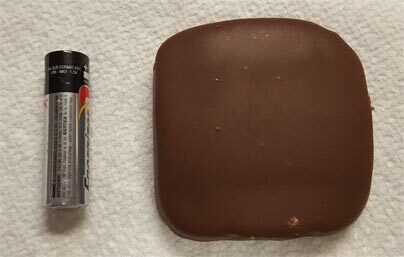 I wonder if its possible to eat that in one bite? It's small but not quite that small! 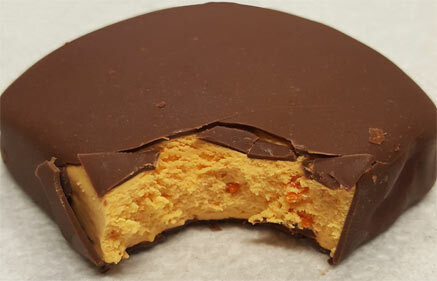 I love the Peanut Butter Cup Butterfinger candy and thought why a Peanut Butter Cup Butterfinger ice cream novelty hadn't been made yet. And so when I saw this in stores now I was filled with joy! So much potential with this one. Gotta temper expectations with the fact this is not an ice-cream version of the candy, but an ice cream intended to resemble the candy. @Dubba Any intentions to review the new Sam's Choice ice creams? They recently came out with a cookie butter & peach cobbler among others. Sam's choice is pretty lazy with their cross contamination protocols, but we'll see, we'll send Nick in if all else fails. Not that kind of cross contamination! 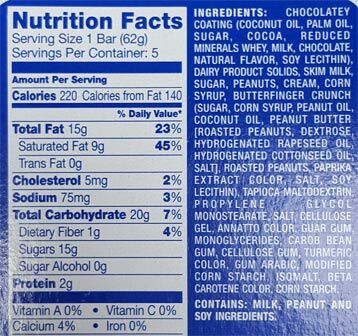 many (if not all) of their flavors say "may contain traces of almonds, cashews, coconut, hazelnuts, pecans, pistachios, walnuts and peanuts". That's a no-no in our house. Yum will have to look for those new Sam Choice ice creams. I noticed that Wal-Mart changed the size of the container into pint size rather than the 8 serving container & it looks like they pulled Coffee & Donuts off the shelf. Save your money. Nothing like a Butterfinger. Should be ashamed to even use that name.